The Earth has been populated by humans for many centuries now and the succeeding generations can learn and remember the previous peoples only from the monuments they leave behind. Many rulers have built grand structures in an effort to immortalize themselves or their empires and some stand till today. Some of these structures are functional while some are ornamental or spiritual, but all of them are symbols of the history of the country and an article of pride for the people. Here is our list of the 10 wonders of the world. One of the Seven Wonders of the world, the Great Wall of China is a long continuous wall made up of different sections. The different sections have been built by different dynasties over a long period of time with the help of stones and other material. The wall stretches over 6300 kilometres in length and if it is measured by the length of all different sections of wall, the total distance will be around 21,196 kilometres. It is the longest man made structure in the world with the widest section being is around 9 meters and the highest point of the wall is around 8 metes. One of the 7 wonders of the world is threatened with erosion and it is believed that the sections may disappear in the next 20 years. Petra is an ancient city located in the valleys of Jordan and was established in 312 BC. It is also known as the Rose City since most of the structures in this abandoned city have been carved out of pink stone. Petra is the most popular tourist destination in Jordan and is also one of the man made wonders in the world. This city is known for its beautiful rock-cut architecture and the ingenious ways used in to carry water. It is also one of the beautiful lost cities in the world. The most popular attraction in Jordan is also popular as the world’s most famous historical archaeological sites. It is also known as ‘Rose city’ because of the red rose coloured sandstone hills. The beautiful architecture has been surrounded by red-tinged mountains that give them a reddish appearance. The structure has been discovered by a Swiss explorer, Johann Ludwig Burckhardt in 1812. During ancient times, these walls provided Petra with a safe haven for its inhabitants because if these red-tinged mountains and a stream provided a source of water. This wonder of the world is one of the largest statues of Jesus Christ and is located on top of a hill in Rio de Janeiro in Brazil. It overlooks the beautiful seaside and took nine years to construct. It is the largest art deco statue in the world made out of soapstone and reinforced concrete. It is one of the most popular tourist destinations in Brazil and is located close to the Copacabana beach. The Art Deco statue structure has been created by French sculptor Paul Landowski and it was built by the Brazilian engineer Heitor da Silva Costa with the help of the French engineer Albert Caquot. The structure is approximately 30.1 metres tall with 6 meters pedestal and 19 meters wide. An icon of Rio de Janeiro and Brazil took around 9 years to complete and construction began in 1922 and mostly made from concrete and soapstone. The stones used came from Sweden. The statue was completed in 1931 and officially opened on October 12, 1931. Known as a symbol of love throughout the world, the Taj Mahal is located in the Indian city of Agra and is a tomb built by Mughal ruler Shah Jahan for his wife Mumtaz. This fascinating mausoleum in the world is intricately carved with Islamic emblems and passages and is a typical example of Mughal architecture in India. It is surrounded by beautiful gardens built in the Char Baug style and is visited by more than 3 million people each year. The main structure octagonal and is capped by a large dome and was a marvel of engineering of time. It is surrounded by four pillars that lean slightly inwards and was the tallest structure in Agra for a very long time. One of the best tourist places in India is located on the Banks of the river Yamuna. Like Petra, Machu Pichu us an ancient city belonging to the Inca period and is located on top of the Urubamba hill in Peru. It has been declared as a UNESCO World Heritage Site in 1983 and since then has gained popularity as a tourist destination. This city was built around the 1450s and was abandoned only 100 years later due to the Spanish invasion of South America. It is also known as the ‘Lost City of the Incas”. It is also one of the beautiful world heritage sites in the world. The compound of Machu Picchu consists of more than 150 buildings that include baths, houses, sanctuaries and temples. Also, it contains 100 separate flights of stairs and most of them carved from one slab of stone. It is said that Machu Picchu was an astronomical observatory and its Intihuatana stone accurately indicates the two equinoxes. This structure located in the Turkish city of Istanbul has a very vibrant history. It was constructed in the 6th century as a Christian basilica but under the Ottoman Empire, converted to a Mosque and was the major mosque in Istanbul until the construction of the nearby Blue Mosque. In 1935, it was taken over by the state and converted into a national museum. Currently, it is the second most visited museum in the country receiving more than 3.3 million visitors each year. This ceremonial pyramid built north of the Yucatan Peninsula belongs to the Mayan era. It has a history of over 1500 years and is dated back to 400 AD. Though the exact purpose of this structure is unknown, it is believed that it was governed by priests and was used to perform religious ceremonies and sacrifices including human sacrifice to please the gods. The name Chichen Itza means ‘At the mouth of the well of Itza”. This famous monument in Rome dates back to the peak of the Roman Empire and has a rather bloody history. It was built as a stadium to stage show fights between animals and people as people watched and cheered for their favourite. More often than not, the fights ended with either one of the challenges dying in the arena. There were many mechanisms to make the fight attractive for the spectators including trap doors to release animals from as well as inlets to flood the arena and stage sea battles. 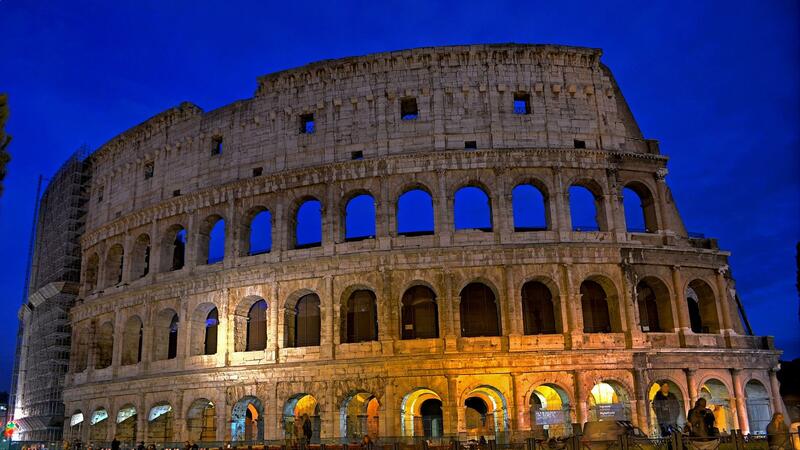 It was known as the Flavian Amphitheatre at the time when it was built. Also, read about places to see cherry blossoms around the world. This famous tower is known worldwide for its tilt and is one of the wonders of the world. The construction was not planned with the tilt in mind though the bell tower started tilting during the construction itself. This was because the ground on one side was too soft and the foundation was not laid deep enough. From 1990 to the early 2000s, there was extensive restoration work to stabilize the building and partially correct the tilt by reducing its angle. Today, the Tower of Pisa is one of the most famous tourist destinations in Italy. The complex housing the Roman Baths is located in Somerset in Bath, UK and is one of the major public attractions in the country. The baths were constructed during the Roman Empire using limestone and the water percolated naturally to this complex from the nearby hills. These baths were destroyed in the 6th century and were reconstructed only in the 1800s. Today, the complex is open for visitors and a museum has also been built there but people are not allowed to enter the water.